ONYX Main Stage opened in October 2015 with the unashamedly grand ambition of being the biggest and best dance party extravaganza ever conceived in Bangkok and one of the premier nightlife destinations in Asia. Epic in both size and scope, we present to you an incredible 2,500 person capacity hub for dance music lovers. The stadium-style Main Room generates an intensity and wild euphoria that few other clubs in the world can match, with superstar EDM and Commercial Dance artists enthralling a crowd of party people and pleasure seekers. Our cutting-edge sound system from D&B Audiotechnik and state of the art lighting systems will stimulate the senses and elevate the soul, while an ultra-futuristic design appeals to a cool, cosmopolitan cast. Whether your style is popping bottles, sipping cocktails or downing shots, full table service is available in multiple languages for your added enjoyment. An iconic DJ booth and a jaw-dropping wall of LED lights takes up an entire end of the club, along with space for innovative live performances and intriguing shows inspired by the most renowned performers in the world. Come to witness international dance music legends as well as the finest up-and-coming DJs take to the stage and electrify the expansive, multi-level dance floor. Within the hangar-like main room a total of 15 VIP booths blend into pockets of social spaces for mixing, meeting and interacting, plus an al fresco zone and lofty second floor balcony ensure a night at ONYX is always a new adventure. Bold, progressive and constantly trying to break new ground, ONYX Main Stage also has a second room, The Odyssey, where underground dance music genres will seduce you away from the pack, spinning anything from dub to deep house, techno to trance. Every element of what it takes to be a world-class superclub has been considered at ONYX Main Stage - from dynamic entertainment to a sophisticated environment and excellent service. We are set to reignite Bangkok's nightlife scene in our hedonistic approach to dance music and ensure we are a revered name in the clubbing community throughout Asia and beyond. For men, sandals, sleeveless shirts, sports attire cannot be worn. Only closed-heel shoes must be worn. For women, there is no dressing code of conduct. School or university uniforms are strictly not allowed. Soi Soonvijai, Rama 9 Road. Located on the Royal City Avenue (RCA) in Soi Soonvijai, Rama 9 Road, visitors can take taxi services which is accessible through both Petchburi and Rama 9 entrances. 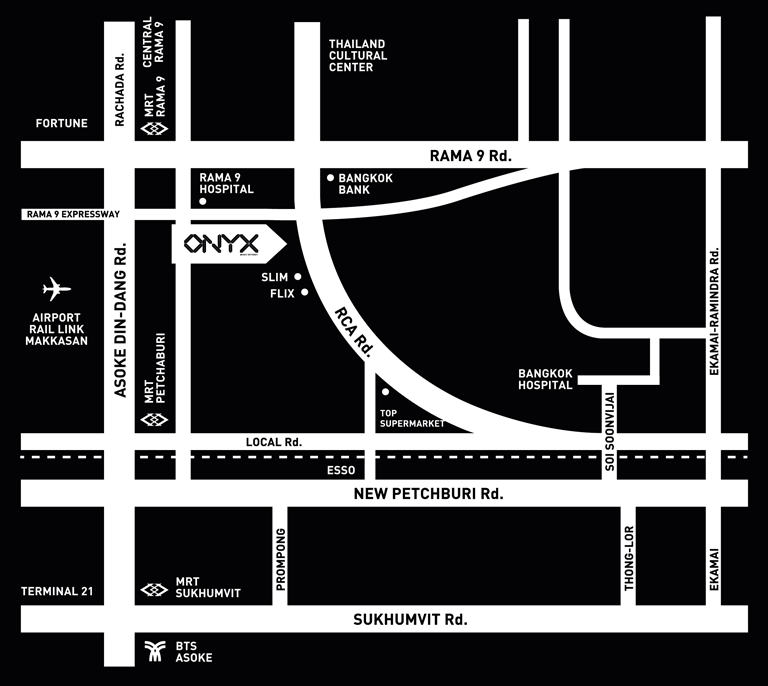 • On Rama 9 side: take the left turn at the entrance and you will find Onyx Club on your right, next to S&P restaurant. 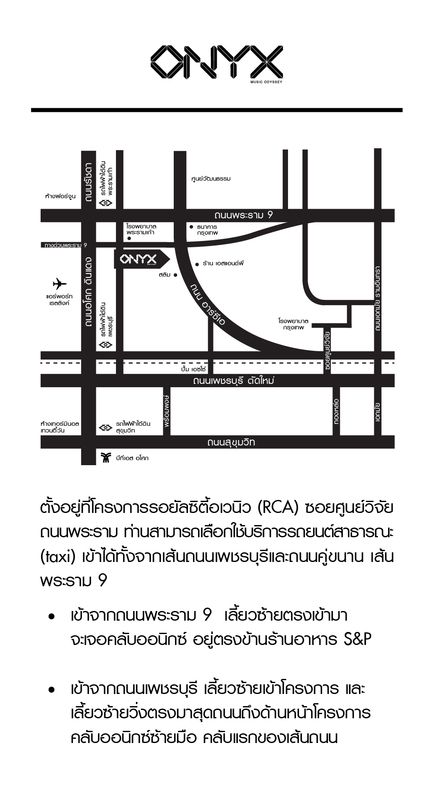 • On Petchburi side: take the left turn to enter RCA, make another left turn at the intersection and go straight. Keep going until you almost reach the end of the street and you will find Onyx on your left side. Traveling by MRT; you can either get-off at Petchburi or Rama 9 Station. Then, taking taxi service and follow the above direction. Travelling by BTS; transit from BTS to MRT at Asoke Station and take MRT to Petchburi or Rama 9 Station.